To most people, his life seemed like a stunning success — the stuff that dreams are made of. 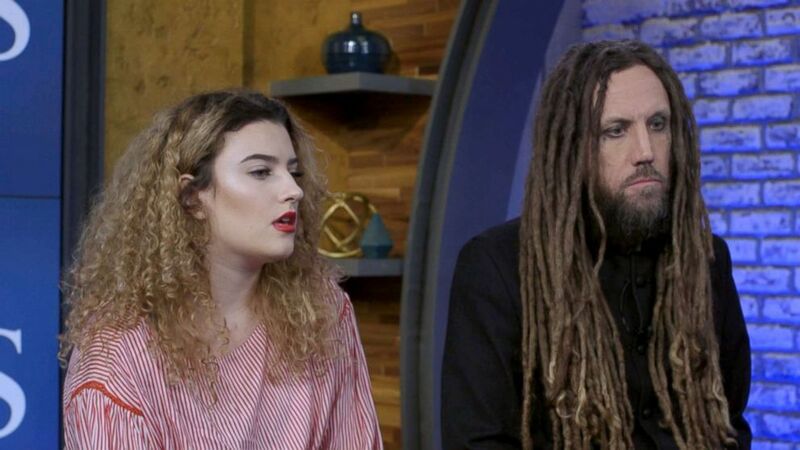 But if you stripped away the fame, fortune and success of Korn rockstar Brian 'Head' Welch, you would have seen a man battling his way through years of searing pain and self-destruction driven by drug and alcohol abuse. Yet it was only when he found himself as deep in the darkness as he'd ever been in the mid-2000s that he made a bold, do-or-die bid for the light. His little daughter, Jennea, now 20, was growing up without the benefit of everything he knew he longed to give to her. He was so determined to survive the long and unforgiving road to recovery that he walked away from a $23 million record deal, he told ABC News. Welch, 48, and his daughter Jennea are the focus of a new Showtime documentary, “Loud Krazy Love," a powerful and unflinching chronicle of the pair's journey through addiction and depression, and the faith they embraced that changed everything. Faith taught them humility. Humility opened the door to therapy, patience and hope. The love between a father and a daughter blossomed over time into a life-affirming partnership. The documentary -- which premieres this month on Showtime -- is also the story of Korn, a band widely-seen as pioneers of the nu metal sound, whose 1998 ("Follow the Leader") and 1999 ("Issues") albums each shot straight to the #1 spot on the Billboard charts. The band was formed in the early 1990's in Bakersfield, California -- the West Coast music mecca that produced the legendary country music giant Buck Owens, who pioneered the powerful, pedal steel guitar-driven "Bakersfield Sound." It was a genre of its own whose most well-known graduates include Waylon Jennings and Merle Haggard - easily two of the wildest outlaws in the history of American country music. Welch said that "Loud Krazy Love" aims to go deeper than traditional rock docs. "It’s much more than that,” he said. Opioid addiction, depression and suicide are rampant across the United States, and the stigma of the disease prevents millions of addicted Americans from reaching out for help. 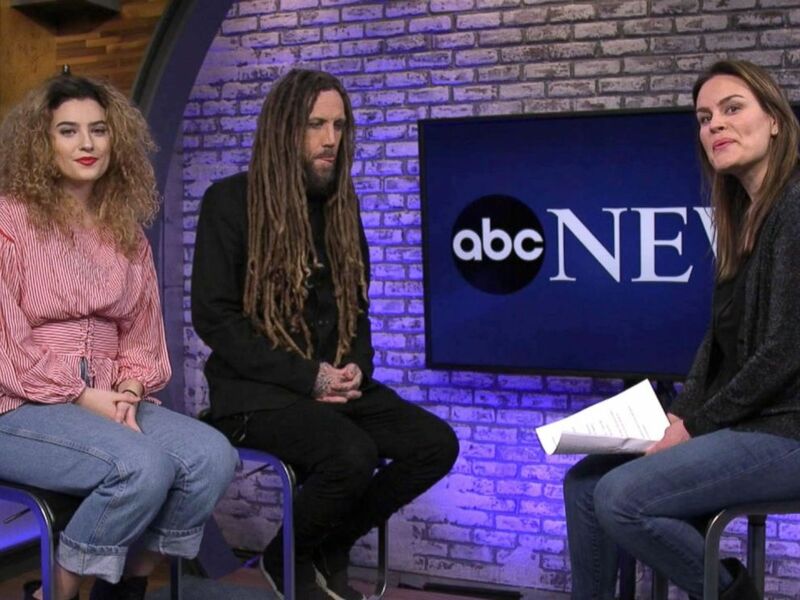 Korn's Brian Welch and his daughter Jennea were interviewed by ABC News' Lauren Cavalea. While awareness of addiction as a legitimate disease is growing, there's more work to do and that's the mission the Welch family is on -- pulling people in tremendous pain and solitude out of that bottomless darkness, by sharing their struggles as well as their triumphs. “I’ve been through all of it,” Welch said with clearly-earned authority on the subject. There’s so much life to live, and if you just keep on breathing and keep on walking, you will get through everything. You have to work on forgiveness and love, and that includes your own self. That’s important because we beat ourselves up too much. He has lost close friends to opioid abuse, and said he believes that the "solution is that we have to get the conversation going." "We have to keep talking about it and we have to find the solutions that are right for each and every individual." His greatest hope for the new documentary is that his story might help draw some of those still suffering out of the darkness he has known so well himself, and onto a road to recovery that he, too, walked. “I just hope that people, what they get from this, is just that it’s never over, don’t ever give up," he said. "There’s so much life to live, and if you just keep on breathing and keep on walking, you will get through everything." "You have to work on forgiveness and love, and that includes your own self." By opening their lives up to the public, the father and daughter hope that their own journeys will resonate with the tens of millions of Americans struggling to break free from the grip of addiction and offer some hope to someone somewhere. “A crazy rock-and-roll, drug-addicted guy like me?" Welch told ABC News. Daughter Jennea said she was driven by the hope that her own story resonates with her peers -- the first generation of American youth to come of age during the height of the opioid scourge indiscriminately devastating the nation's small towns and big cities alike. Connecting with family or friends and finding something you are passionate about are two things that she said helped her. What would she tell her depression-plagued 13-year old self, ABC News wondered. “I would tell myself that there are people around you who love you and care about your wellness, and that you will find your place in the world. You have purpose,” she said. Welch said that his faith in God is what ultimately saved him. His faith today, he said, is steadier than when he first started down this path. “No one wants critical, 'you can't do this or that' religion," he explained. "People want authentic love and that’s what we are displaying," he said. Welch said that in his experience, Christianity is nothing like the intolerant, hyper-pious caricature sometimes portrayed in contemporary media and pop culture. It's not like that, he insisted. "All the drama you see about Christianity or the Catholic religion? People are seeing through that, and there are really authentic people out there with faith." "And so we hope to be that," he said. "Loud Krazy Love" is produced by I Am Second Media and Ditore Mayo Entertainment. Filmmakers Trey Hill and Scott Mayo told ABC News that they made the documentary with the "desire to humanize and normalize what a real faith might actually look like... Our real lives are just as messy and tumultuous... and this film portrays that." Mayo continued, “We wanted to create something – we don’t think of it as a faith-based film. It’s a remarkable story where God is just a part of it. You have a choice in what to do with the most shameful stuff in your life. You can choose to stay trapped by it or you can choose to face it head on, and I hope that people who are trapped in their shame will come away with the ability to see at least two steps in a different direction. What do the filmmakers want viewers to take away with them after seeing this film? Hope for those suffering without it. “I hope that somebody who sits down, watches the movie from start to finish and walks away with the feeling that the artists behind the making of the movie really cared for them," Hill said. "That somehow they felt seen and understood as a human on a real fundamental level, that there are echoes of their own stuff there that they can go, 'OK, I’m not alone. While I might be stuck right now, I don’t have to stay stuck.' And I hope that they leave the experience with a little bit of wind in their sails." "You can choose to stay trapped by it or you can choose to face it head on, and I hope that people who are trapped in their shame will come away with the ability to see at least two steps in a different direction.